Venice is one of the most famous cities in the world, highly regarded for its beauty and romance, which has been associated with this location for many centuries. The Italian city is built on 118 islands and 177 canals and is connected by approximately 400 bridges. As a means of transport throughout it's colored history, the grand canal are seen here on a typical Venetian day, with its many boats and gondolas transporting people and cargo on a fine day. In the past, transport throughout Venice was only by foot or by the waterways. Being dubbed one of the most beautiful cities in the world, Venice exudes the European charm and a richness of history that has made this city so popular. With its beautiful Renaissance architecture seen in this tapestry, with the locals in period clothing on the gondolas in the foreground, this tapestry brings the beauty of this romantic Italian city into your home. 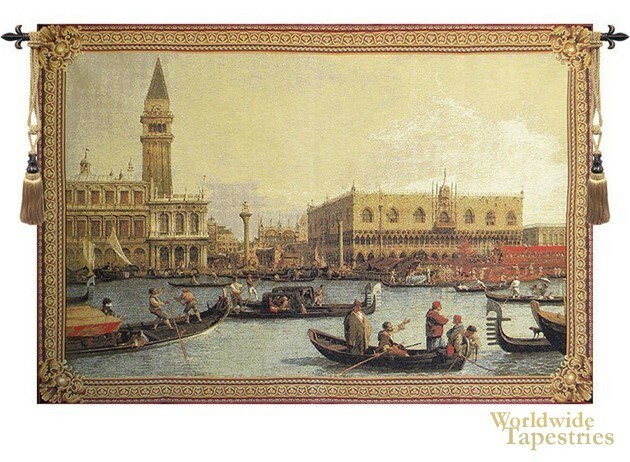 This tapestry "Venezia" is backed with a lining and has a tunnel for easy hanging. Dimensions: W 78" x H 57"